Our mission is to develop outstanding engineers and ideas that change the world. A glimpse at the UW Engineering students, researchers, and faculty whose innovations will change the world. Soon we will have statistics for the first cohort of Direct to College students! For UW staff and faculty, CoE provides data on student admissions, transfers, enrollment, majors, and degrees granted in Student Data Reports (UW NetID required). Engineers drive the innovation economy and are vital to solving society’s most challenging problems. The College of Engineering is a key part of a world-class research university in a thriving hub of aerospace, biotechnology, global health and information technology innovation. Over 50% of UW startups in FY18 came from the College of Engineering. 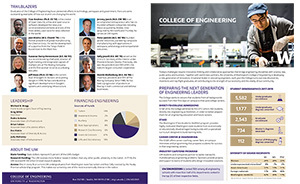 The College of Engineering is committed to developing and supporting a diverse student body and faculty that reflect and elevate the populations we serve. We are a national leader in women in engineering; 22.4% of our faculty are women compared to 16.9% nationally. We offer a robust set of diversity programs for students and faculty. Our college is committed to a culture of inclusivity, discovery, understanding and mutual respect — now and for the future. I am incredibly proud of the work done here in an environment of respect and intellectual honesty, where we celebrate our differences. Together, we uphold the values of our college and build a community in which all members can thrive. The University of Washington is an engine of economic growth, today ranked third in the nation for the number of startups launched each year, with 65 companies having been started in the last five years alone by UW students and faculty, or with technology developed here. The College of Engineering is a key contributor to these innovations, and engineering faculty, students or technology are behind half of all UW startups. Engineering research expenditures totaled $153M in FY18.